Grilling in the backyard on a weekend evening is one of the favorite pastimes of many out there. There’s nothing like the smell of charcoal to end your day with a delicious burger, hot dog, or even a steak or chicken. The Expert Grill Heavy Duty (HD) charcoal unit is a great way to get that delicious food on your table each time you want to BBQ. You can invite friends over or just have your family settle down for delicious food and enjoy the wonderful summertime evenings. This grill offers a large cooking area, warming rack to keep your other items warm while you finish grilling, and many other features that are perfect for your backyard kitchen area. Grilling for a crowd can be an issue if your grill is not the right size. With the Expert Grill HD, you can cook up to 20 different burgers all at one time so no one is left to wait for dinner. There’s over 300-square-inches of cooking space that allows you to cook up multiple pieces of your favorite go-to dinner items. Cook up some chicken breast for a salad, delicious burgers and dogs for the big game, or grill your favorite steak to perfection. With the spacious grilling surface, you do not have to worry about someone’s food getting cold or someone still waiting for their dinner because the grill is too small. When you purchase a grill for your backyard area, you want to know it’s going to be durable and last for years to come. You do not want to have to purchase a new grill every time grilling season approaches. 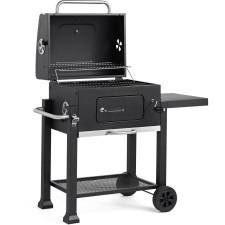 With the Expert Grill HD model, you can trust that the durable construction will last. The grates are made of heavy, durable cast iron and the lid itself is powder coated to keep your heat inside the grill where it belongs. The unit is made of sturdy material to keep the grill cooking for years to come. It also offers a durable ash pan that is adjustable to help you get the perfect amount of heat to your food at all times. Over 350-square-inches of cooking space. At the time of this review, Amazon shows 67 different customer reviews on this particular grill. The Expert Grill HD has an overall 4.3 out of 5 stars rating by consumers just like you who have purchased the grill and used it. There were only 13 reviews that were less than favorable on this particular model. Some of those who are negative things to say shared that some of the grills were missing parts when they were shipped. One complained that the lid didn’t seem to seal tight enough, and another said it took them several hours to assemble the grill itself. There were over 50 positive reviews for this Expert Grill. There were several who really loved their purchase of the Expert Grill. Those who were in favor of the grill said things such as … “Nice heavy material” … “This grill is great” … “Great grill!” … “Sturdy, durable grill” … “Five stars” … “BBQ delight”. Overall the consensus on the Expert Grill HD is that it is a good investment for those looking for a midsize charcoal grill to add to their back patio or deck area. You can easily move the grill around to where you want it to stay and enjoy scrumptious items each time you cook. It is an affordable grilling option for any particular budget out there making it a great addition for those who to grill but don’t have $1,000’s to spend on a new unit. Consider the Expert Grill HD for your next grilling purchase to give you ample cooking space, durability, and a great addition to your backyard festivities. So grab your favorite beverage, crank up the fire with your selection of charcoal, and enjoy a delicious meal each evening.